So remember a few weeks ago when I posted the Tzatziki recipe and promised a lamb gyro recipe sometime in the near future? Well, today’s your day. I will be the first to admit that I rarely cook with lamb. I’ve always kind of been under the impression that it’s difficult to cook and expensive. However I decided to give a shot . And I discovered that not only is it really distinct and delicious, but that it’s really not any more expensive than similar cuts of beef or pork. Who knew? One of my favorite ways to eat lamb is in a gyro, so I wanted to replicate those flavors. However, I don’t have a spit, nor do I really need a large chunk of seasoned lamb from which to slice sandwich shavings. I also wanted to make my gyro a little more healthy (since every gyro I’ve ever had has been glistening with grease), so I worked on a recipe for a gyro burger. I can hear it now: “But Kate, burgers aren’t healthy!” Well, that can be true, but it mostly depends on the cut of meat you’re using. Lean ground lamb is available, particularly at high-end groceries, and if you can’t find that, you can always ask a butcher to grind a pound of either the leg or the loin, which are very lean cuts which, combined with the fact that lamb is high in many essential nutrients, makes it a great choice for healthy meals. All you do is take some of my favorite seasonings–garlic, coarse-grain mustard, red wine vinegar, rosemary, oregano, Kosher salt, freshly ground black pepper, and onion flakes: and gently incorporate them with your hands into 1 lb. of ground lamb. Shape the meat into 4-6 patties. You can make circular patties, but I find oblong patties work a little better when you fold the pita bread over the meat. Grill over medium-high heat for about 5 minutes per side. Remove from heat and allow to stand for 5 minutes. When ready, place the grilled lamb on a piece of pita bread. I used our Flatbread recipe, only instead of making one large loaf, I made 4 smaller, pita-sized circles and it worked beautifully. If you do do that, however, cover the flatbread with a clean cloth when you pull them out of the oven and allow them to cool completely. This way, they’ll remain soft and pliable and won’t crack when you try and fold them over. Anyway, place the grilled lamb on the pita bread, add some thinly sliced onions and tomatoes (my tomatoes are missing…they were beyond gross). Spread with a generous layer of Tzatziki. Fold like a taco. If you’re assembling all the gyros ahead of time (or just for convenience), wrap the folded gyros in aluminum foil. That way, you can avoid embarrassing Tzatziki-related drama and you can also pretend you’re eating something from a street vendor (or a mall food court, whatever) but knowing that you were cool enough to make the food yourself. Instructions: Gently combine lamb,garlic, onion, mustard, salt, pepper, vinegar, oregano, and rosemary with your hands and shape into 4 oblong patties. Grill for 5-6 minutes on each side and remove from heat. Allow to stand for 5 minutes. Place on pitas or flatbread and add onions, tomatoes, and Tzatziki. Fold like a taco and serve immediately. For easy serving and clean-up, wrap in aluminum foil. Have I told you how much I love you? lol… I so jacked up the last winged attempt at a gyro, can't wait to try your recipe! just discovered your site not too long ago and I'm loving your recipes! These sound delish and I love lamb… it's been in our family diet since before I was born! I will talk to MomChops and see if I can talk her into making these with me here soon! We have a good supply of lamb locally so it should not be a problem! Thanks for the recipe girls! Girl! This sounds good! I love gyro's!!! Yummy! Can’t find lamb here in a small town in the midwest but am going to try ground pork. Can hardly wait to try it! Love this recipe. Lamb is delish! Many folks think they don't like lamb and don't know there is a difference between wool sheep and the hair sheep now gaining in popularity. "Hair" sheep don't need sheared-they shed-and as a result don't impart the lanolin from their coat to the flavor of their meat. Long story short-if you don't think you like lamb check out your local farmer's market, and see if someone offers ground lamb from hair sheep. I just had gyros yesterday and today (leftover) from a restaurant. My favorite food! Thanks for the recipe. I am going to make this! Wait… isn't anyone else curious about "tzatziki related drama"??? There HAS to be a funny story there somewhere! Thanks for all the yummy recipes ladies… it's like you are a part of our family now! We love gyros and I have been awaiting this post to impress my husband and use my free greek yogurt coupons before they expire. Ahh now you need to add french fries into the gyro. That is how I had them in greece. The bread link isn't working for me. I just finished eating my first gyro burger and I am in love. As I was eating it I was planning on eating it again in the near future. My husband wants me to make them next week for his parents. Thank you for such an amazing recipe! (I did cheat and buy the pita, but it was awesome pita). What side(s) would you suggest with this??? We had this last night and they were very good! I did use beef instead of lamb; I don’t even know if I can get ground lamb here; I’ve never seen it (I live in an isolated place overseas). Anyway, I made my own tzatziki and flatbread to go with and everything was SO GOOD!! We had grilled veggie skewers with it. I was also told they could not grind it for me (beef only) I took it home and put it in my food processor worked like a charm! 1) “burger pita” which is what u describe here, with the burgers, but ususally we make them from half lamb-half pork meat, we don’t use to make them 100%lamb. In both the sandwiches we put sliced tomatoes, some parsley, onion rings and fried potatoes in them. we add some salt-pepper-oregano before we wrap the sandwich and that it! I don’t have onion flakes, but I do have onion powder. Also, I am trying ground chicken, as that’s what I’ve got in the freezer! These were delicious. The flavors were perfect– tasted just like a gyro. I agree about making the patties oblong– it fits better in the pita that way. 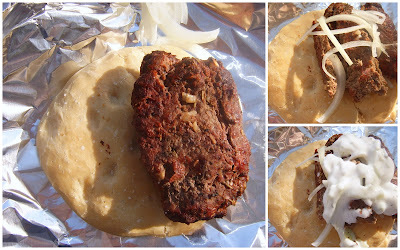 It never occurred to me to make a gyro with ground lamb (instead of sliced) so I love the idea! Since it is no longer grilling season, can the burgers be made in the oven or skillet? What do you recommend? Thanks!! Sure! Either one, although I usually use a skillet.